I’ve been aware of this book most of my life. My dad had a battered paperback he’d picked up on a business trip and read. My mom got all into the miniseries (starring the woefully miscast Richard Chamberlain!) when it was on TV. It really never occurred to me to read it. But then Lucy joined my book club. Lucy, avid fantasy reader, Star Wars junkie, could not believe that I hadn’t read Shogun. She told me fervently how it had changed her life the first time she read it, how she’d been so involved in the Japanese culture, as described by the book, that’d she’d accidentally bowed to people, and said “Hai!” instead of “Yes!” I promised her I would read it . . . sometime. A few months later, at the book club Christmas paperback exchange, I picked up a nice, chunky, wrapped book . 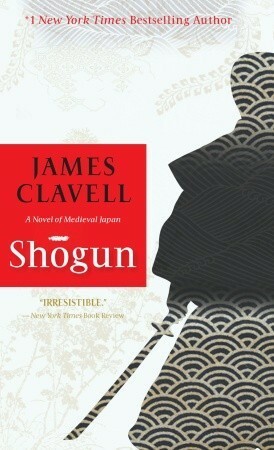 . . and found myself the proud owner of a copy of Shogun, thanks to Lucy. By now other friends had recommended it, and I could avoid it no longer. I dove in. Reading Shogun is a commitment, I won’t deny it. It clocks in at around 1,200 pages, pages with narrow margins and very tiny print. But tackle those dense pages and you will be rewarded. You’ll come away from this book with a new understanding of Japanese culture, a true respect for anyone who dared to brave sailing around the globe back in ye olden days, and a violent hatred of the Jesuits. Okay, possibly the last bit was just me. Anyway! Moving on! Clavell has meticulously researched Japanese life and politics in the 16th century, as well as the culture and politics of Europe at that time. The contrast in the two cultures is fascinating. Japanese people at that time were cleaner, healthier, better educated, and lived decades longer than Europeans. And at any time they could be ordered to commit suicide by their leader, and they would do so. Even women and children could find their lives forfeit if a husband or father displeased the authorities. Through the eyes of Blackthorne, an English pilot working for the Dutch, we see the good and bad of this way of life versus what he knew in Europe. As Blackthorne is initiated in the ways of the samurai, the reader is also treated to an inside view of bushido. And with Blackthorne we are caught up in a desperate power struggle as feuding warlords vie for control. An intricate, thrilling look at Japanese history, put the enormous page count out of your mind and dive in! Sensuality: Some PG-13 type “love scenes,” two rather frank descriptions of, ahem, adult toys. Adult themes: suicide, adultery, divorce, religious prejudice, geishas. This looks awesome. Another one to put on my to-read list.